If arch enemies Germany, France can be friends; why can't India, Pakistan cooperate? Kashmir is a zone of chaos, a highest militarised zone in the world. Kashmir is a bone of fight between the two Nuclear Countries. The independence of India and Pakistan gave the birth to conflicts, chaos, and hatred. The two independent dominions of Pakistan and India were born on August 14 and 15 respectively. The Kashmir conflict is a legacy of the past. The international community had given Pakistan and India many chances to resolve the outstanding issues. Right from partition, apart from UN Ssecurity Council resolutions, various agreements, mediations and talks have taken place between the two nations. Tashkent Agreement, Shimla Agreement, Lahore Declaration, Agra Summit, Peace Process and Confidence Building Measures are the glaring examples. 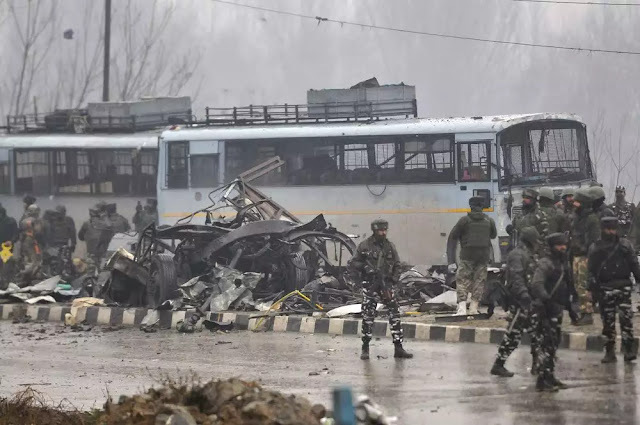 On April 14, 2019 a suicide bomber crashes a car packed with 300kg of explosives into a convoy of Central Reserve Police Forces (CRPF), killing more than 40 Indian paramilitary personnel, and injuring at least 70. The terror attack took place in Pulwama to which India vowend retaliation. Nothing can justify this act that took lives of more than 40 persons. In the aftermath of the Pulwama terror attack, India withdrew the most-favoured nation status to Pakistan. India hiked customs duty to 200 per cent on all goods imported from Pakistan, and the bus service to Muzaffarabad was also suspended. Moreover, India also decided to "stop" the flow of its share of water to Pakistan from rivers under the Indus Waters Treaty after the Pulwama terror attack. Post Pulwama attack, separatist leaders were arrested during overnight raids, as India launched a major crackdown across the Kashmir valley. Pravin Sawhney, editor of "Force" newsmagazine in one of his articles said that Balakot was well chosen as it was evident that the operation was meant for publicity. As a case in point, unsubstantiated media reports claimed that 300 to 350 Jaish terrorists in Balakot were eliminated by IAF strikes, a claim that has since been questioned by the international media, which was allowed by Pakistan to visit the target site. Subsequently, other media reports have emerged claiming that the IAF fighters did not actually cross the Line of Control. Instead, Balakot was attacked using stand-off weapons. Hence, deliberate confusion continues. Mamata Banerjee, chief minister of West Bengal, believes that starting with Pulwama the entire episode is nothing but a charade to reap electoral benefit. She berated Modi saying, “We don’t want politics over the blood of jawans”. Arundhuti Roy has viewed these latest incidents in and around Kashmir more holistically, and argued that almost all Indian governments since 1947 have addressed the issue with disdain and violence, and not empathy, which has spiralled it to a situation where it has brought the two nuclear armed nations to war, not once but on several occasions in the past and this is dangerous. She argues that while most Indian governments lacked sincerity in addressing the complaints of Kashmiris, things got much worse since 1990s. Congress president Rahul Gandhi was also skeptical about the timings of Pulwama attack and accused the Modi administration of wanting to instil war hysteria in Indian public for their own benefit. Many other Parliamentarians have openly accused Modi of orchestrating the Pulwama attack. One politician, Wamin Mishra, has gone as far as saying that Modi knew about the attack 9 days in advance and he has proof to back his claim. According to government sources, the Indian Air Force airstrike on Balakot killed about 300 militants which was regarded as baseless by Pakistan government. Indian Airforce jets while crossing the line of control inside the Pakistani territory were hit by Pakistan Air Force. The lone surviving Indian Wing Commander who was able to eject was subsequently taken under custody by the Pak army. Pakistan Prime Minister Imran Khan later sent back the Indian Wing Commander Abhinandan to his home country as a peace gesture. Even a limited confrontation would resolve nothing, on the contrary it would aggravate tensions and delay the process of conflict resolution. India and Pakistan should deal with Kashmir in such a way that future generations do not take up arms. The two should learn a lesson from Germany and France, who was once bitter neighbour; they fought against each other in the two global wars, but are now part of strong European Union, sharing a free border, both using the same Euro. India and Pakistan should repair the damage they have done for the past 65 years and pledge to cooperate in economic, technological and social areas. This can be achieved by soft hand, making Line of Control as Line of Cooperation to diminish and eliminate their mistrust and stubbornness.